Guernsey Nos. 17 (1917) 29 (1920) and 6 (1921) and 25 (1923). An honest and reliable defender from Corryong, Jack Greenhill had a relatively short senior career at Carlton – a career that was interrupted, and eventually halted, by the demands of running his family’s dairy farm during the period immediately after World War 1. Included in his 41 senior appearances was one season as vice-captain of the Blues, and five games in finals. After playing six matches as a 19 year-old in his debut season of 1917, Jack was released by Carlton and went back to help out at the family farm. In the last year of World War 1, the demand for fresh meat, milk and produce was at an all-time high. Jack simply couldn’t be spared to chase a football around the playing fields of Melbourne. After two years away, he returned to Princes Park in 1920 and soon won back his place at half-back in the Carlton senior team. Although relatively short at 180 cm, life on the land had given Greenhill a powerful physique and great endurance. At his best on a defensive flank, he could hold down centre half-back when required. He was among Carlton’s best players in that year’s final series, although the Blues fell short of the mark when they were beaten by Collingwood in the Preliminary Final. 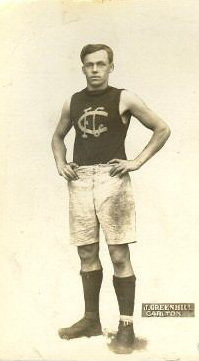 Twelve months later, as vice-captain of Carlton (and having represented Victoria in that year’s ANFC Carnival in Perth) Jack played in his second successive Preliminary Final – a sensational match against Richmond. Early in the game, he and his opponent Donald Don tangled, and the Tiger forward threw a haymaker that knocked Greenhill unconscious, putting him out of the match. Then, during the half-time break, a fierce thunderstorm swept across the MCG and blanketed the ground with hailstones. In a slogging second half, Richmond nosed in front and won by 8 points. As minor premiers, Carlton promptly exercised their right to challenge Richmond to a Grand Final rematch, only to be beaten in another cliff-hanger by four points. Don was summoned to the tribunal (after the Grand Final) and suspended for eight weeks. Jack was recalled to Corryong again in 1922, but his absence was partly compensated by the arrival at Princes Park of his younger brother Charlie, who played three matches in a back pocket between rounds 4 and 7. Sadly, the Greenhill brothers never got to play together in navy blue, because Charlie didn’t go on, and Jack bowed to the inevitable when he finished up after only three more appearances in 1923. Greenhill wore Guernsey No. 26 whilst playing with Carlton's reserves team in 1916. Contributors to this page: Bombasheldon , pblue , PatsFitztrick , tmd1 , WillowBlue , Jarusa and admin . Page last modified on Thursday 30 of May, 2013 20:47:16 AEST by Bombasheldon. 2019 - Co-Captains Cripps & Docherty.